How do I book a pamper Party or BFF session? Call us on (09) 973 0968 or email sales@lizzylove.co.nz, and we be more than happy to assist. The earlier the better is best. We do have some people booking a full 6 months in advance, but generally at least 6 weeks before the party is recommended to help ensure you get your preferred day and time. We will always do our best to accommodate you, but please dont leave it too late as spaces can become limited and there is a chance your preferred time may be booked out! Please contact us now to reserve your preferred day and time. What days of the week is the pamper parlour open? After school and weekend parties are available. Weekdays (Tuesday to Friday) start times between 4pm and 6pm. And start times between 9am and 2pm on Saturday and Sundays. What are the minimum and maximum number of guests for a party? For parties, the minimum is 4 including the party girl, and the maximum is 8. Please do contact us though if you require more than 8 as we can normally work some magic to accommodate more. When do I have to confirm final guest numbers? We understand that final numbers may not be known when first booking party. We contact you during the week prior to the party to confirm final numbers, and also what craft option the party girl would like for her guests. Yes, we do ask for a 50% deposit of the minimum of 4 girls, within 5 days to confirm your booking. We will provide all the details at the time of booking. This may be paid by Visa or Mastercard (in-store or online via Paypal or direct bank transfer). We ask that the balance for final numbers and any extras be paid at the end of the party. What if one of my guests has an allergy or special diet requirements? Please let us know as soon as possible with the details, and we will do our best to accommodate everyone. We do ask for parental supervision for those who are known to have anaphylactic reactions. Can I bring a cake, and open presents at the party? Absolutely. Please just let us know before the party so we can ensure we allocate time for this. Are parents required to stay for the duration of the party? Not at all. Parents are welcome to drop off and pick up. The birthday girl's parents are welcome to stay, however unfortunately we don't have a lot of room for other parents to stay. 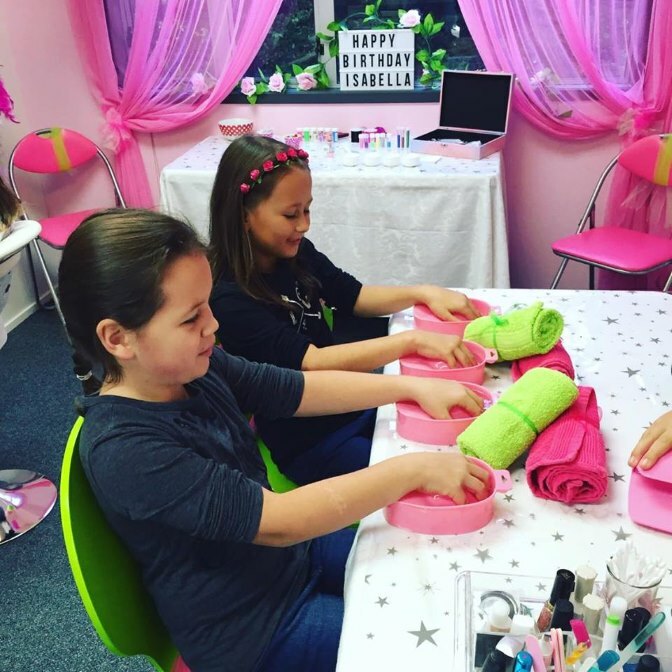 The girls tend to relax and enjoy the pampering with their friends without lots of parents hovering around - so use the time to your advantage! There is a cafe next door if the parents wish to go for a coffee or bite to eat (Mon to Sat), or pop up to the Albany mall for a bit of therapeutic shopping by themselves. How early should the Birthday Girl arrive? It is nice for the Birthday Girl to come a little earlier to greet guests that are travelling separately, but please no earlier than 10 minutes before the start time as often parties run back-to-back. If you have chosen a Lady Party you are welcome to come 20 minutes prior to set up food. What if a guest is late to the party? We allow 10-15 minutes for girls to become acquainted and await the arrival of guests. If we do have to start the party without some guests because they are running late, they are welcome to join in and we will do our best to accommodate. What if a confirmed guest doesn't turn up? We allocate staff and arrange catering based on confirmed numbers, depending on circumstances we are understanding and flexible however if more that 1 confirmed guest cancels and we aren't given at least 24 hours notice, we will need to charge for those guests. What do guests need to do in preparation for the party? We ask that all guests arrive with dry clean hair and any old nail polish removed. Unfortunately, LizzyLove is a child parlour. Sorry we do not pamper adults. How soon after booking do i have to select my package? The sooner the better, ideally at the time of booking. However we understand that decisions do need to be made and we are required to be adivsed of package at the latest 7 days prior to booking date to ensure everything is ready for you. The deposit required upon booking is non-refundable, however we will do our best to accomodate should anything unforeseen arise. If the situation occurs that the party is required to be postponed and is less than 48hrs out from the booking there is a fee per head accociated with food catering and an alternative date/time can be discussed. If this situation arrises please make contact as soon as possible. Can LizzyLove pamper parties be held at home? We have a lovely parlour setup in store where our pamper parties are held, we currently do not offer at home mobile parties. - Any queries please don't hesitate to get in contact!